This is the pattern booklet I got at Knitting Camp in late April ... it was a simple knit, all 2 x 1 ribbing, knit flat. 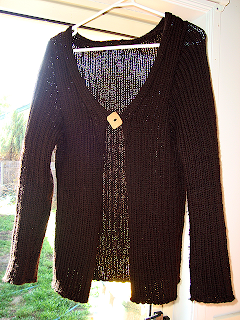 I finished it in a month, and must admit I hurt my hands by knitting all that ribbing, too quickly. Anyway. Here's the end result! Knit with Cascade 220. Delightful stuff! It's pilling pretty quickly, but I'm willing to forgive it, for its softness and warmth! I've done the button / buttonloop twice now - once too low, and it's currently too high - so hopefully I'll be third time lucky! But it's a very comfy cardy, I really love it. Petal loves it too, and keeps pulling and chewing at it. Hmmm. oh well done! It's all very warm and snuggly looking! Gorgeous. It looks like a great classic easy wear piece - wonderful! oooh wow - it looks gorgeous! What a perfect go anywhere sweater. Petal has good taste. Bravo! 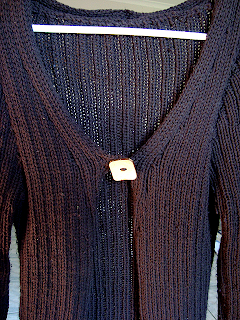 These simple sweaters may be a slog to make, but they will enhance the wardrobe for years! It even makes a coathanger look good. Pet the puppy. It will help heal your hands. That is such a pretty cardi! Really gorgeous - I'd love that in a longer version, too. Nice colour...must look great on you with your skin tone. It's really lovely. Well worth sore hands, I'm sure. Oh, it's very pretty and it looks like the kind of piece you'll end up wearing a lot!